What is Modern House Plan ? What is Modern House Plan? The Modern House Plan is clean-lined , sharp and crisp-edged using shapes that are sophisticated looking homes.and ,functionally focusing first and foremost and primarily using a modern material and exposing the structures or using the structures in a cunning way . The modern house has a smooth and shiny surface ,everything ,maybe even white and balanced. Modern homes are very elegant,neat ,sleek, precise and are constructed to the finest of a quality of workmanship which is a beauty by virtue of this attribute.Taking the cue from the motto,” God is in the detail”. It uses the most up-to-date techniques of construction and using new ideas of materials and inspiration from ;modern art and graphic and using equipment for constructability of modern forms. Modern homes are greatly simplified taking the cue from the motto “Less is more”, giving way to a clean aesthetic where materials meet in simple, well-executed joints. Modern house was most typically using the concrete structures using a flat or broad low-pitched gable or shed roof. 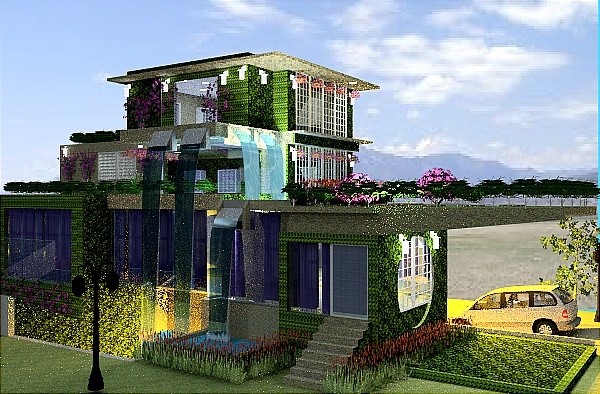 Exposed structure, an expressive using modern materials such as single panel glass cladding, silicone and , and the incorporation of landscaped areas into the house and on the top of the house, Living roof concepts where landscaping are placed on the rooftop where it is extensively waterproofing to keep the roots from uprooting the waterproofing. In an architectural sense, Modern architects were Louis Sullivan & Frank Lloyd Wright( US), Otto Wagner (Vienna), Victor Horta ( Brussels), Le Corbusier (France) and Antoni Gaudi (Barcelona). The German Architects -Ludwig Mies Van der Rohe and Walter Gropius organized the Bauhaus School that was a great influence on the modern Architectural movement. However, for the purpose of this article, we would like to refer to all homes that are presently being used as a Modern house . A cantilevered structure is a feature that is typified in modern homes, It may be used as a counter balance. A concrete cantilevered structure slab extended from the house, without any support from a pillar or beam, is useful to provide effective shading. The modern house is a flat or broad low-pitched gable or shed roof and this roof may also be cantilevered. Shapes and the forms of houses are based boxes shaped, or interlinked boxes and the vertical forms are juxtaposed against horizontal elements for dramatic effect and illusions effects. Materials are often used in well-defined planes, Modern house exterior wood is also stained so that the texture and character of the wood can be expressed. some modern home uses of synthetic sidings added steel structural support. Modern homes use traditional materials in an interesting way, where materials such wood, brick, and stone are simplified lacking the traditional ornaments, in ways where architecture reflects a modern aesthetic. Traditional horizontal clapboard siding is used as vertical board cladding used in large planes. Stonework and brickwork are simple, fascinating ornaments removed, and used in rectilinear shapes and extruded planes. Modern home has Asymmetrical exteriors with curved walls or unusual angles and shapes.Forms may tend to be organic breaking away from the rigid, regular,symmetrical as there are studies that shows much benefits accrue from organic forms, read here. Exposed structure and an expressive use of modern materials and columns exposed to draw aesthetic in the exposed structures. Exposed concrete block, bricks, exposed wall are left bare finish to reveal the true character of the structure in lieu of a finished material.Concrete floors, plastered wall are stained and exposed, long-span steel trusses permit open column-free spaces, and service pipes such as also exposed. Modern home adopt the new “skin-and-bones” architecture for their emphasis on steel structure and glass enclosure and vice versa. Modern home has natural and smart landscaping. The best modern homes are energy efficient. They are oriented to take advantage of natural forces to generate renewable for passive solar heating in the winter. Check out our modern house floor plans as they are the best on the world wide web.